Renting? Think you can’t adopt a greyhound? Think again! Do you dream of owning a castle, complete with rolling paddocks, puddles and a smattering of delectable doggie treats for your hounds to roll in? A place to call your own, with as many adopted dogs as you like? Me too. 75 greyhounds, in fact. With a butler to bring them bones in silver bowls. But for the moment, you’re renting - and that precludes pets. 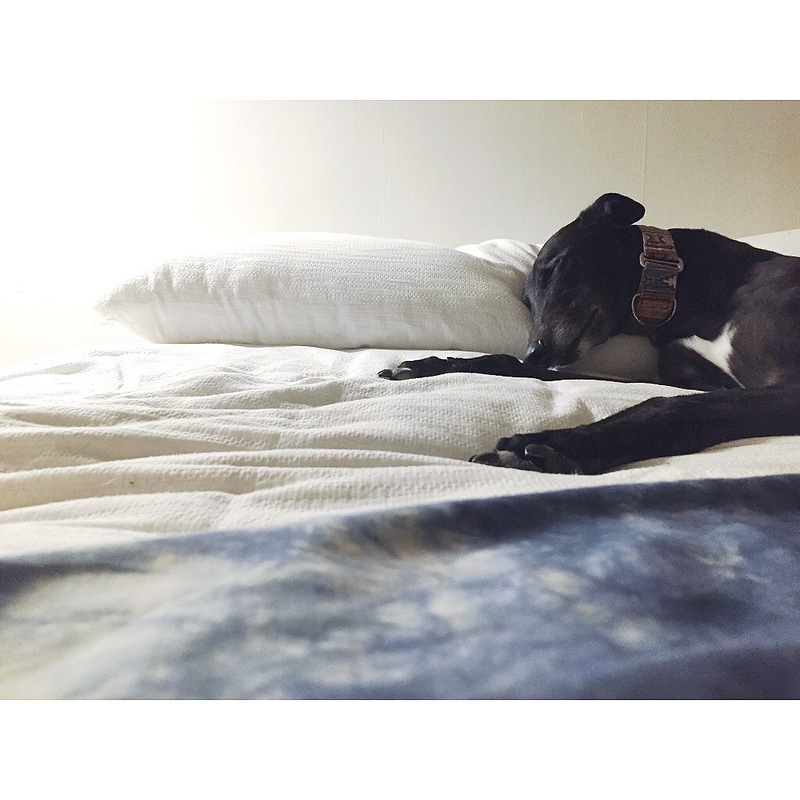 Many people I talk to (the same ones who like to pat and chat to Dave while we’re out walking) say they’d love to adopt a greyhound, but can’t because they’re renting. In the eyes of most real estate agents, pets are a hassle - evoking hairballs, scratched floorboards and more backyard holes than a family of caffeinated moles. Considered grubby, chewy and bark-y, canines (and their humans) stand little chance against their civilized, animal-free counterparts. But (as we on the GAPSA blog know) greyhounds aren’t just any dog. They don’t bark, smell or shed. They might as well scrub the loo and leave the seat down, they’re so considerate. That’s why, when looking for a new place to live last year, Dave and I hatched a crafty plan to woo prospective real estate agents. (Not in an evil way). 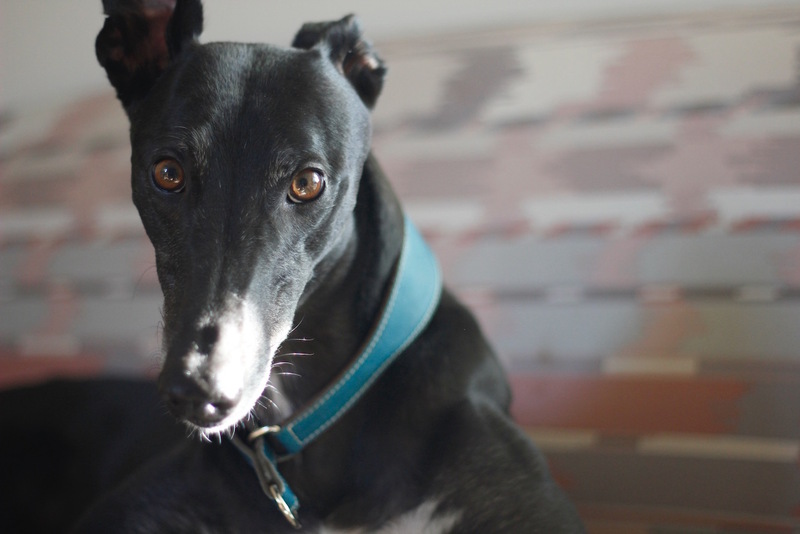 Today we’d like to share our trick to help you pitch your retired racer to real estate agents - boosting your chances of scoring a rental property. Stepping into the office to hand in my application, the well-dressed woman at the front desk looked around me, distractedly grabbing my ID and asking - so, where’s Dave? Dave was outside, tethered to a pole. But it soon became obvious as two more ladies emerged from adjoining rooms asking the same question, that I should have led him straight through the door. The whole building was ga-ga for Dave. We were at real estate HQ, applying for a rental property that had previously stated: NO PETS. But instead of taking no for an answer, I’d written and lodged a resume prior to filling out an application. The resume was for my dog. Perhaps the owner would revise their ‘no pets’ policy upon seeing Dave’s ridiculously cute snoot? Greyhounds make the perfect urban pet - why not plead their case? It worked - a little too well. The owner could see that Dave - rather than being a destructive, disruptive addition to their city cottage - was a dreamboat. (Plus, opening doors for retired racers makes everyone feel warm n fuzzy. Perfect!) She agreed to accept him at the property. We clapped our paws with delight. By the time we arrived at the agency to add my name to the lease, everyone was desperate to meet Dave. I barely got a look in. It turns out they were all mad for greyhounds, and having Dave visit was the highlight of their week. They lavished him with love accordingly. Dave and I now live in our ultimate rental abode all thanks to a little creativity. 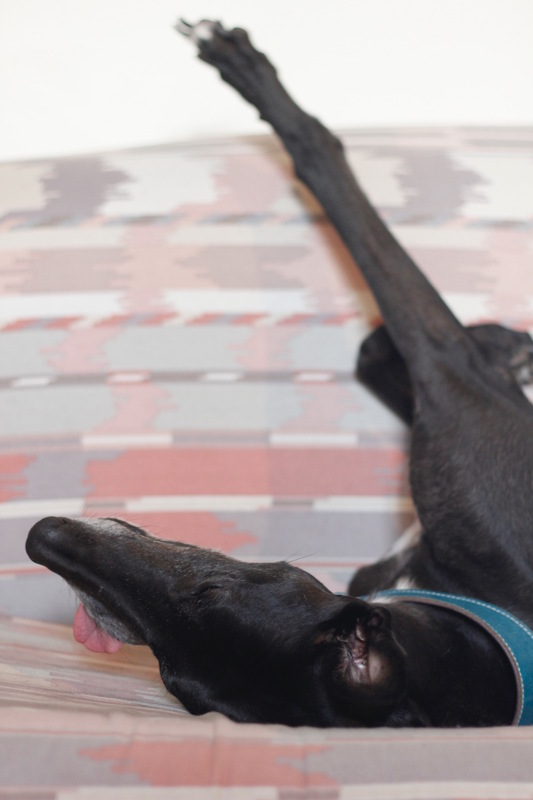 It might not work for everyone, every time, but taking the initiative to endear your greyhound to prospective landlords and estate agents can certainly help get your paw in the door. Want to see what we wrote? 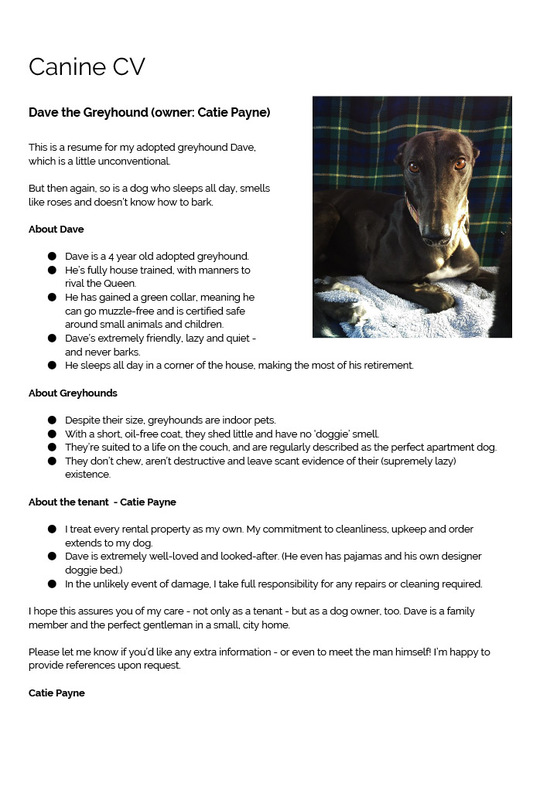 Here’s Dave’s Canine CV, for your domestic info. Feel free to use this as a template any time you need additional paperwork for your pooch.